Bernice and Paul Nesper have given several planned gifts to Ball State University as a way to thank the institution that has provided them so much professional and personal satisfaction. 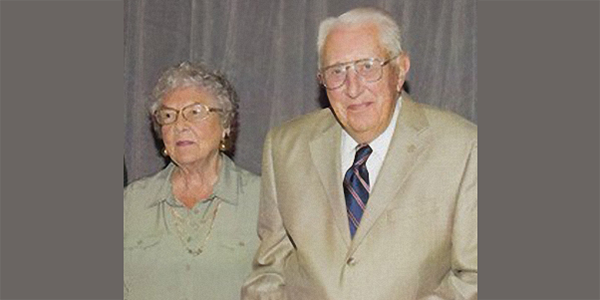 Paul and Bernice Nesper moved from Nebraska to Muncie in 1957 for the professional opportunities Ball State had to offer. Since then, they have been actively involved in the university through generous engagement and philanthropy. Paul started as a supervisor of student teachers, while Bernice worked as a typist for the students of the university. As his department grew, Paul had the opportunity to focus on administration. Prior to his retirement, Paul served as the director of the doctoral program and was the chair of the Department of Educational Administration. "It was a tremendously rewarding experience to be here," says Paul. "Ball State was just beginning to grow, and I felt that I would like to be a part of an institution that was growing and grow with it." As the university grew, so did Paul and Bernice's passion for Ball State, as well as their relationship with the community. "We made lifetime friends, from doctoral to master's students, and to this day, we still have a close relationship with them," says Bernice. One of the many relationships the Nespers formed was with the audiology specialists at Ball State. When Paul developed difficulty hearing, he turned to Ball State's audiology department for assistance. The department exceeded the Nespers' expectations by offering tremendous support and providing solutions that helped Paul overcome his hearing loss. To show support for their favorite programs, the Nespers designated planned gifts to Ball State, which provided attractive benefits to them as well. A bequest of their residence will provide funding for assistantships for the Department of Speech Pathology and Audiology. A gift of appreciated property offered an immediate federal income tax charitable deduction and helped the couple avoid paying capital gains tax. Through a charitable gift annuity, the Nespers were able to fund the Ball State baseball program as well as the Speech Language and Audiology Clinic. A charitable gift annuity not only provides lifetime income, which is so important during retirement, but also a variety of tax benefits, including a federal income tax charitable deduction. "We felt an obligation to make a significant impact on the Ball State programs that were near and dear to our hearts without jeopardizing our financial security," says Paul. "These planned gifts were the best options for us." Even after their retirement, the Nespers couldn't get away from the university. Together they volunteered for the Alumni Center at the welcome desk for 17 years. Their commitment to the university spread to a multitude of individuals in their lives. As Paul and Bernice reflect on the gifts they've given to the university, they attribute it to their passion for Ball State. "We can go down the line of the individuals in our family with degrees from Ball State," says Bernice, "and that's because we truly believe in Ball State and all it has to offer." Contact D. Mark Helmus at dmhelmus@bsu.edu or 765-285-8312 to learn how you can follow in the Nespers' footsteps and create opportunities for future Cardinals for years to come.